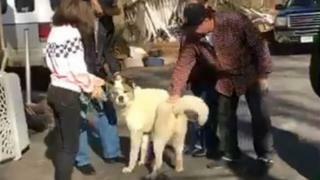 A dog called Kingston has been reunited with his owners 101 days after he went missing during the deadliest wildfire in California's history. "When I found out, [it] just about brought me to tears," Gabriel Ballejos told Associated Press (AP) after being reunited with his dog. "I'm so proud of him. I can't believe it. He's a true survivor." "When I went to check [the trap] on Sunday, there he was," local dog-trapper Ben Lepe told AP. "It was awesome to see him and know he would be fed and warm." "He still smelled even though they used stuff that neutralises the skunk smell," Suzanne Maxwell, a local resident and volunteer for Friends of Camp Fire Cats, told the BBC. She described a "heart-warming" reunion between Kingston and his family.